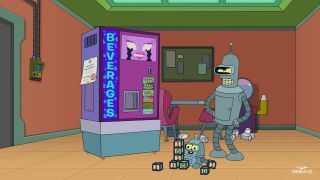 The foulmouthed robot Bender has a son with the office soda machine in the first episode of the seventh season of "Futurama." Good news, everyone! "Futurama" is back, with the seventh season of the animated sci-fi series premiering Wednesday night (June 20) on Comedy Central. Thirteen new episodes will air weekly over the course of the summer, kicked off by an hourlong double-dip Wednesday that features the sort of inspired lunacy "Futurama" fans have come to know and love. In the season's first episode, called "The Bots and the Bees," the foulmouthed robot Bender fathers an illegitimate child with the office soda machine. Episode two, "A Farewell to Arms," deals with an ancient prophecy that predicts the world will end in 3012 — a nod to modern-day doomsayers who claim the apocalypse will come in December of this year. Fry makes a go at life in the distant future, finding work at an intergalactic delivery company called Planet Express. Planet Express is run by the eccentric 160-year-old Professor Hubert J. Farnsworth, a self-described mad scientist who also happens to be Fry's great-nephew, going down 30 generations or so. The company has a handful of other employees, including Bender, an attractive female cyclops named Leela and the thoroughly incompetent Dr. Zoidberg, a lobster-like creature with a dismal grasp of human physiology and anatomy. The Planet Express crew gets into a variety of scrapes as it ferries packages to the many alien worlds scattered throughout the "Futurama" universe. Professor Farnsworth often informs Fry and the gang of seemingly suicidal missions with a hearty "Good news, everyone!" — his catchphrase, which rarely precedes anything anyone would want to hear. Life on Earth can be tough for the crew as well; global warming has run amok in the 31st century, and the disembodied head of Richard Nixon frequently rules the planet. "Futurama" has garnered a cult following over the years, along with a great deal of critical acclaim. Last year, for example, the show earned two Emmys, one for outstanding animated program and the other for outstanding voiceover performance. Fry and Leela deal with an ancient doomsday prophecy in the second episode of the seventh season of "Futurama." The road for "Futurama" has been rough despite the accolades. The show debuted on Fox in 1999 and aired for four seasons before ceasing production in 2003. "Futurama" reruns aired in syndication on the Cartoon Network, and then the series came back in four new direct-to-video films, which were released between 2007 and 2009. Comedy Central reached an agreement with Fox to broadcast those four movies as 16 half-hour episodes, which became season five of "Futurama" and aired in 2008 and 2009. Finally, Comedy Central picked the show up for a more conventional sixth season, airing 26 new episodes in 2010-11. The show's devoted fans resurrected "Futurama" by showing how much of a market still existed for the series, said Billy West, who provides the voices of Fry, Zoidberg, Professor Farnsworth and many other characters. "I want to thank every single one of them, and if I could I would in person," West told SPACE.com. "Because that's what brought the show back; we couldn't do much about it." West said this season should be a lot of fun. Guest stars include comedian Wanda Sykes, George Takei (Mr. Sulu from TV's original "Star Trek" series), Patrick Stewart (Captain Jean-Luc Picard from "Star Trek: The Next Generation"), Dan Castellaneta (the voice of Homer and a number of other characters on "The Simpsons") and Estelle Harris (George Costanza's mom on "Seinfeld"). And things may really heat up between Fry and Leela, who recently began a romantic relationship (after much persistence on Fry's part). "Fry and Leela get closer than they've ever been before — it's up to your imagination," West said. "It's always a tease, but it's kind of fun to see where this whole thing is going after all this time. It's kind of a cliffhanger/suspense thing with those two. You never know." While the long-term future of "Futurama" isn't exactly assured, there's enough creativity in the writing room to keep the show going for a while, West added. "They have enough story ideas for probably five more years' worth of episodes," he said. "I happen to know that."